PARIS (AP) — When Kylian Mbappe netted France’s final goal in a 4-2 win over Croatia last July, the rising star became only the second teenager to score in a World Cup final — emulating soccer great Pele. After exchanging praise for one another for months, the pair finally met on Tuesday at an event organized by a Swiss watchmaker in a lavish Parisian hotel. Their meeting had initially been planned for last November but was canceled because of the 78-year-old Pele’s poor health at the time. Mbappe’s rise to the top has been meteoric. After impressing with his former club Monaco, he received his first call-up with France in March 2017. He was sold to Paris Saint-Germain that summer for 180 million euros ($210 million) and won the World Cup less than 12 months later. Mbappe’s most memorable game in Russia was in in a 4-3 victory against Argentina where he scored twice, earned a penalty and showed off his blistering speed under the eye of a powerless Lionel Messi. Mbappe said he knew that he would “enter history” alongside Pele with a goal in the World Cup final. After scoring twice in Brazil’s 5-2 win against Sweden in the final of 1958, when he was just 17, Pele went on to win another two World Cups with Brazil. Pele said Mbappe and his French teammates reminded him of Brazil’s great national teams from the 1960’s. 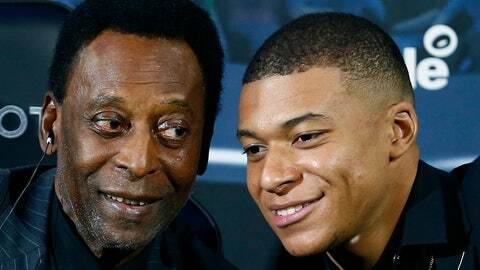 “Mbappe said France will prepare to win the next World Cup, but he should know that we (Brazil) are also going to get ready,” Pele said. Mbappe was also was named the World Cup’s best young player in Russia, like Pele in 1958. Mbappe has often been compared to the Brazil great for his precocity, but in terms of style, with his devastating speed and skills, he is closer to France great Thierry Henry. Asked about Mbappe’s main qualities, Pele said he was impressed by his pace and intelligence. “And he is unpredictable. He is changing his game all the time. It’s his main advantage,” said Pele, who scored more than 1,000 goals during his career. That’s a tally that Mbappe does not expect to match. Journalists were invited to attend the meeting but were not allowed to ask questions.